CH-47F Chinook is also being operated by 18 other defence forces around the world. Large sections of the Chinook fuselage are being manufactured in India. New Delhi: India has officially been handed over first of the Chinook helicopters at Boeing’s facility in the presence of Indian ambassador to US Harsh Shringla. The ‘India-Chinook Transfer Ceremony’ took place at Boeing’s facility in Philadelphia. DGAO, Air Marshal A Dev, from Air HQ (Vayu Bhawan), Consul General of India in New York Sandeep Chakravorty and Air Attache Air Cmde Shivanand were also present during the occasion. In 2015, India had placed the order for 22 AH-64E Apache attack, and 15 CH-47F(I) Chinook transport helicopters and will receive all of them this year. The AH-64E Apache attack and CH-47F(I) Chinook transport helicopters are the newest models of the aircraft. This is expected to help modernize the Indian Air Force’s helicopter fleet. 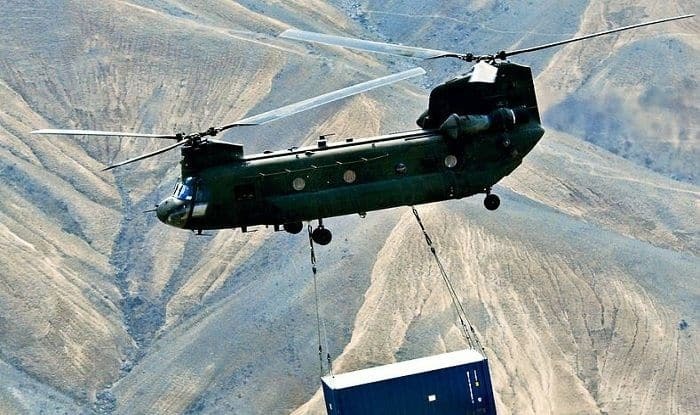 According to Boeing, Apache is the world’s leading multi-role attack helicopter and CH-47F Chinook is an advanced multi-mission helicopter that can help in delivering heavy payloads to high altitudes. Both of them are also being used by the US army. Boeing is also training Indian Air Force (IAF) crew for the helicopter. In October of 2018, 4 pilots and 4 flight engineers of IAF were trained for Chinook helicopters in Delaware USA. India is the 14th nation use Apache and 19th nation to use Chinook in its forces.